Simply SAAB: Independent SAAB Specialist in Pittsburgh, PA.: Look Fast, Go Fast. Just got in an order of performance parts for my personal 9-5 from the good folks at www.GenuineSAAB.com. Stuff looks great, and the quality of workmanship really is outstanding. Performance stuff is such a small part of what I do, but it sure is fun! Looking to get 300hp out of the 9-5 come Spring, and this is the first step. These cars really are capable of some serious power without too much effort and $. The stock downpipe looks almost comical next to the 3" stainless steel GenSAAB version. Noticed an immediate change in throttle response, and the turbo comes on instantly, no lag. The intake pipe is also quite an improvement over stock. However, its benefits will not really be utilized until the engine computer software is re-written. 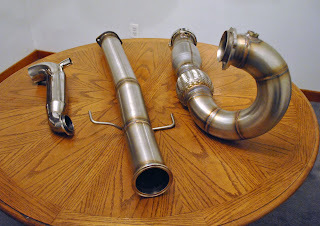 I totally agree that the GS parts are built really well...I've been very happy with my downpipe. So much less work to install the GS pipe. Free time is hard to find. The restriction in the system will always be the 5cm2 turbine housing on the turbo, not on the intake side. Could go with the 6cm2 if you could find one, but I'm not looking to make big power. I'll be happy with 300ish.